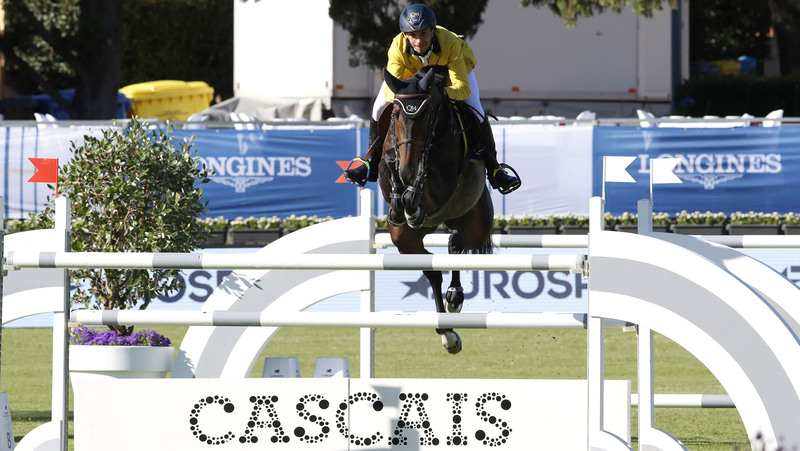 Yuri Mansur Guerios (BRA) and 13 year old bay gelding Amor took centre stage in the opening Longines Global Champions Tour Cascais, Estoril class, the horse making a brilliant comeback following two years away from the sport. Yuri took the win in the tightly contested class, finishing just ahead of Denis Lynch (IRL) with Fairview Aliquidam in second and Pius Schwizer (SUI) with Chidame Z who claimed third. Also placed was Michael Duffy (IRL), the young Irishman pulling out a stunning performance with his chestnut mare Jule van den Tinnenpot to take fourth in today’s first class. Frank Rothenberger’s course was a challenging curtain raiser in Cascais, the 1.45m course offering up a few options for the riders and leaving room for plenty of errors as the horses and riders took to the track for the first time this weekend. Simon Delestre (FRA) was one of the first to go clear, the French rider looking on flying form after placings in Saint Tropez and Cannes. With his fairly new mount Filou Carlo Zimequest, Delestre tested the course with his grey horse, opening up the horse’s stride to speed around the second phase. They set the time to beat at 31.96s with plenty of world class combinations yet to come. The tight time allowed for the first phase caught out a few, meaning they could not progress to the second part of the class. Emil Hallundbaek (NED) with Cabanus, Jane Richard Philips (SUI) with Clipper du Haut du Roy, Leopold van Asten (NED) with VDL Groep Elexia, Christian Kukuk (GER) with Cordess, Duarte Seabra (POR) with All About Fernhill, Alberto Zorzi (ITA) with Vannan and Nicola Philippaerts (BEL) with H&M Harley vd Bisschop were all caught out, jumping clear but unable to fight for the win. Yuri Mansur Guerios (BRA) soon powered to the top the leaderboard, the yellow-coated Brazilian riding Amor beautifully to shave milliseconds off the time to beat. The Brazilian took out a stride to the last, both horse and rider trusting each other implicitly. Their partnership proved to be the winning formula, as the pair stopped the clock in 29.93s and took the lead. The next class, the first round of GCL Cascais, Estoril, will kick off at 21:00 local time as the floodlights come out for the team competition. Tune in via the official GCL Facebook page, or watch on GC TV with expert commentary, analysis and insights.